Our studio, located in Burbamk (Los Angeles, CA), is an intimate and welcoming place. One of the most legendary studios in the world. 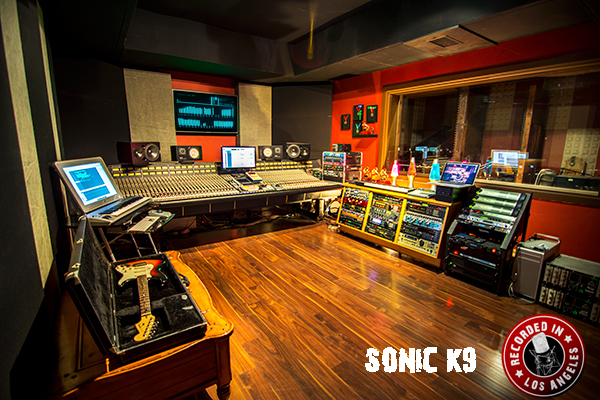 A 10,000 square foot, three room recording studio located in Canoga Park, California. Rumbo was designed & built in 1979 by Daryl Dragon, also known as the "Captain" of the Captain & Tennille. Comfort along with a 'no pressure', creative environment in a studio was always the motto that Daryl believes enhanced he & his wife's (Toni Tennille) success in the music industry, and with the successful track records of countless other successful producers / engineers / artists that have since completed projects at Rumbo for more than two decades, the musical outflow from Rumbo speaks for itself. Rumbo Recorders has become a respected, trusted recording facility and has firmly established itself as a major creative force in the Southern California-based recording industry. EastWest Studios is the world’s premier recording facility. Located in the heart of Hollywood, the studios have given rise to some of the most celebrated music of the last fifty years, from Frank Sinatra to The Rolling Stones, and has produced more Grammy-winning albums than any other studio in the world. Now, this iconic complex has been brought into the 21st century by an astonishing collaboration between EastWest Sounds producer Doug Rogers and internationally renowned designer Philippe Starck. The idea was simple – take to the most historic recording studios in the United States and transform it to meet the needs of contemporary artists and producers recording in the new millennium. The key ingredient, however, was in preserving the integrity of the live recording rooms, as built by legendary engineer Bill Putnam in 1961. The result is a truly unique experience that stimulates both the aural and visual senses, that combines the epic sound recordings of the past with a bold, playful vision of the future. A place where artists can meet, mingle, and be inspired, while at the same time shaping the way music is heard for generations to come. We invite you to discover EastWest Studios for yourself by exploring our diverse recording spaces, our incredible history, and how we provide today's discriminating artists the utmost in service, all in an unparalleled creative environment. In the early 1990s, Michael Jackson returned for his album Dangerous in Studio 1. Also in Studio 1, Guns N’ Roses recorded their album “The Spaghetti Incident?”, Meatloaf recorded Bat Out of Hell II: Back To Hell, and Tool recorded Ænima. Orchestrations were recorded for Natalie Cole’s Unforgettable, along with the soundtracks for What’s Love Got to Do With It and The Bodyguard, which included Whitney Houston’s infamous cover of “I Will Always Love You”. The Rolling Stones took over Studio 1 – and every studio in the building – for their album Bridges to Babylon. Studio 2 had become the epicenter for rock music by this time, welcoming Iggy Pop, Slayer, Tom Petty, Incubus, AC/DC, Elton John, Blink 182, Greenday, Weezer, and the return of The Red Hot Chili Peppers for their hit album Californication. Studio 5 saw mixes from R.E.M., Liz Phair, The Indigo Girls, and Nirvana’s MTV Unplugged in New York. In 1999, owner Allen Sides sold the building to computer magnate Rick Adams, who changed the name to Cello Studios. Capitol Studios is housed within the walls of the historic Capitol Records Tower at the world famous intersection of Hollywood and Vine. Events at Capitol Studios offer a truly unique, exclusive space with legendary appeal. Providing premiere event spaces and amenities for hosting formal parties, VIP red carpet events or artist showcases within the setting of the mid-century architecture of Capitol Studios. We have several spaces available that can accomodate both small and large gatherings as well as an outdoor area that affords your guests views of the heart of Hollywood. Capitol Studios also houses a fully equipped Video Village, so as we expand into the exciting world of video content capture we can offer these services to our clients. Our legacy spans multiple generations, weaves through nearly every genre of music and lives inside millions of loyal music fans. And we’re just getting started. Since its completion in 1956, Capitol Studios has been a staple of the recording industry. Iconic artists like Frank Sinatra, Nat King Cole and The Beach Boys first gave life to its rooms and to this day, major icons of popular music continue in their wake. Today, Capitol Studios stands on the shoulders of half a century of vision, creativity and imagination. Craft will always be king, perfection will always be the standard the experience will always be uniquely Capitol Studios. Capitol Studios was recently fully refurbished to ensure that we remained a cutting edge, state of the art facility where artisan craft can continue to thrive as it has for the past 60 years. The long and rich history of Record Plant began in 1968 with one of the most famous inaugural projects ever: Jimi Hendrix's Electric Ladyland. The first big mixing session, shortly thereafter, was the soundtrack to the Woodstock movie. Between them, these two landmark sessions set in motion a seemingly never-ending string of hit records, from what would eventually be several studios sharing the same name and seal of quality. Although rockers like the Rolling Stones and the Black Crowes still book sessions at the Record Plant, the studios have become an R&B and hip-hop hot spot in recent years. Since big live rooms are not always required on these sessions, some of the live rooms now resemble large lounges, adding to the 'luxury hotel' vibe of the studios. Besides Hollywood's film industry, which has used Record Plant to produce blockbuster soundtracks like Mission Impossible, Men In Black and Austin Powers, the current studio clientèle reads like a Who's Who of urban music: Kanye West, Nas and Beyoncé, Black Eyed Peas, Nelly and Usher and veterans like Stevie Wonder and Herbie Hancock have recorded there in recent years, among artists such as Lady Gaga, Justin Timberlake, Christina Aguilera and Madonna. When these photos were taken, the studio space was being shared between Snoop Dogg and another hip-hop giant, Mos Def. Unsurprisingly for a studio of this size and with this clientèle, each of the four large rooms hosts an SSL console: three are 9000 J-series desks with up to 80 inputs, while Studio 2 has a 4080 G-series console. Other technical features include custom Augspurger monitors and a huge collection of outboard. Equally impressive is the mic collection: besides RCA and Royer ribbons, Record Plant owns more than a dozen vintage tube Neumann mics, including U47s, U67s and three M49s. In every decade since its founding, The Village has produced the favorite songs of all time. As the look and sound of music changes, so does The Village. From legends like Fleetwood Mac, The Rolling Stones, B. B. King and Bob Dylan to current artists like Lady Gaga, Coldplay, Taylor Swift and John Mayer you would be hard pressed to find an artist who hasn’t recorded here. In addition to creating chart topping albums, The Village is well known for its impressive list of movie soundtracks. From The Bodyguard and Shawshank Redemption, to Walk the Line, The Help and Crazy Heart, we are equipped to handle any and all situations while also solving each and every need of our clients. High quality in a custom setting has always been the hallmark of Sunset Sound. In business for over 50 thriving years 50thAnniversarythe five-room facility has stayed the course it set originally: serving the needs of musical artists using customized consoles, discrete component equipment, and vintage microphones. That philosophy has proven itself over the decades and also appeals to a large group of very contemporary artists including such luminaries as The Black Keys, Jason Mraz, Sheryl Crow, Beck, Daughtry, Paramore, M83, Rascal Flatts, The Dixie Chicks, Ryan Adams, Morrissey, Maroon 5, Avenged Sevenfold, Slipknot, Kellie Clarkson, and many, many more. Located in the heart of Hollywood, our studios capture the magic of recording. World-class artists that use our unique environment have an unparalleled level of sophistication during the recording experience.